Born in Colombia, Gabriel García Márquez began his career as a journalist in the 1940s, reporting from Bogotá and Cartagena and later serving as a foreign correspondent in Europe and Cuba. In 1961, he moved to Mexico City. Alongside his prolific journalism career, García Márquez published many works of fiction, including novels, novellas, and multiple short story collections and screenplays. Following the publication of his novel Cien Años de Soledad (“One Hundred Years of Solitude“) in 1967, he became best known for his fiction and achieved worldwide recognition as a gifted storyteller. He was awarded the Nobel Prize in Literature in 1982. He published the first volume of his three-part memoir Vivir Para Contarla (Living to Tell the Tale) in 2002. 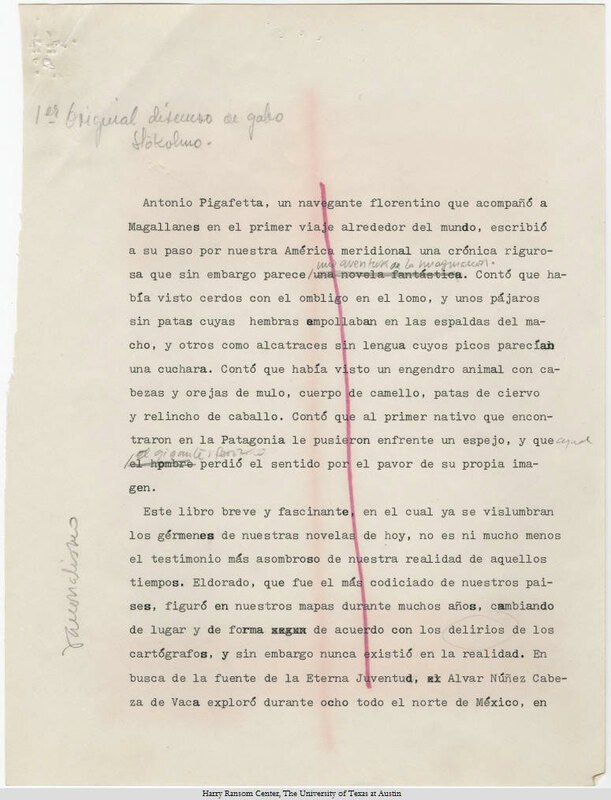 This audio file of his Nobel Prize in Literature acceptance speech—along with the 13-page speech draft—is one of several select items available through the digitized collection of García Márquez’s archive. Gabriel García Márquez’s text of Nobel Prize in Literature speech (1982).